Hemel Town returned to winning ways on Tuesday night as they thrashed struggling Staines Town 4-0 to close the gap on their Conference South playoff rivals. Another healthy following of Tudors fans saw them finally get all three points after three successive draws, and Dean Brennan’s men also claimed a clean sheet in the process. The first real chance saw Zane Banton’s effort well saved by Staines keeper Jack Turner, before Dennis Oli shot well wide when well placed. Oliver Hawkins managed to get a header in but again it was off target. On 23 minutes Hemel were awarded a free-kick on the edge of the box, which is Jordan Parkes territory. And, sure enought, the skipper continued his fine goalscoring form by curling the ball into the net to give the visitors the lead. It was pretty much all Hemel after this, with Hawkins and Matty Harriott both just failing to find the target. Staines were always dangerous on the break, however, and Laurie Walker twice had to be quick off his line to thwart their efforts. Staines came out in the second half looking to get back into the game and they started causing a few minor concerns for the Hemel backline. Jorrell Johnson had to clear the ball off the line after Walker had lost his footing. Soon after this scare, the impressive Banton made a quick crossfield run, leaving several defenders in his wake before firing in a shot that Turner could only parry into the path of Jordan Parkes who made no mistake for his second of the night to put the game to bed. 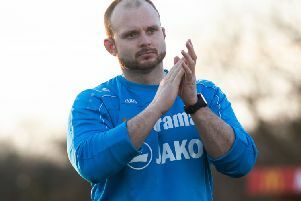 Hawkins was then denied by Turner when he was put through on-on-one, and Banton was also denied by the heroics of the Staines keeper, who was doing his best to keep his side in the match. The Tudors eased up in the latter moments of the game and the home side created and wasted several decent opportunities, with Walker not really troubled. Staines number two Tommy Brewer was lucky not to receive a red card after a nasty two footed challenge on Ed Asafu-Adjaye, the referee deciding it only warranted a yellow. Jordan Parkes saw the resulting free-kick just fly past the post with the keeper beaten. Asafu-Adjaye completed the scoring on 78 minutes after a goalmouth scramble saw the ball cleared to his feet. The diminutive defender hammered the ball first time into the net and he ran to receive the plaudits from the Tudor faithful behind the goal. Parkes had one last chance to complete his hat-trick late on but his shot went wide of the post. All in all, an impressive result for Hemel who consolidated their position at seventh in the table and they can look forward to the visit of Bath City to Vauxhall Road on Saturday with some confidence. Hemel – 1: Walker 2: King 3: Brown (Connolly) 4: Parkes © 5: Hyam 6: Johnson 7: Oli (Kabamba) 8: Harriott 9: Hawkins (Potton) 10: Asafu-Adjaye 11: Banton. subs not used – 15: Lee 22: Head. Man of the Match – Zane Banton.